Buy your bag for life at the Co-op and support World Debate Club! The Cooperative supermarket is a well known fixture on many of Britains high streets, but did you know that by shopping there you can also support iDebate and the World Debate Club? 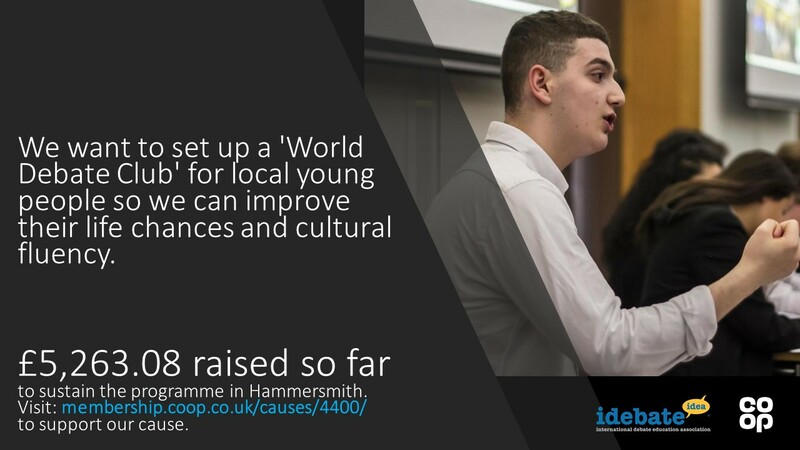 Our World Debate Club at Hammersmith and Fulham College is one of the community projects Co-op Food is supporting this year through it's innovative 'Bags for Life' programme. Since 2006 the Co-op has been actively reducing the number of single use carrier bags we give away through a number of proactive initiatives to help protect the environment, reduce carrier bag litter and conserve vital resources. Their aim being to help create a zero waste society. By donating income from the sale of carrier bags, community projects such as World Debate Club also benefit. World Debate Club programme aims to widen participation in civil society and to empower young people to be advocates and changemakers in the community. Based in Ealing and Hammersmith College our weekly World Debate Club see's FE Students explore Human Rights / British Values, developing their understanding of democracy, the rule of law, individual liberty and mutual respect and tolerance for those with different faiths and beliefs in a safe environment. How do I support World Debate Club? Alternatively, if you want to support us, but don’t want the burden of donating you can always support us through go-raise. With Go raise you can support us as you shop online. Numerous online shops, travel companies etc. are signed up to donate a small amount of your purchases to us if you set us as your preferred charity. Go to https://www.goraise.co.uk/idea for more information. We are very thankful for any and all support. Everything donated helps us run clubs for marginalised young people to become future leaders!